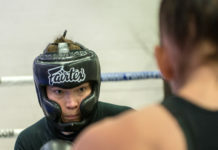 Katja Kankaanpää (formerly Kalliokoski) looks to make a name for herself at an international level as she takes a step-up in competition to face Valkyrie Flyweight Champion Mei “V.V” Yamaguchi (9 wins and 3 losses). This high-profile bout at 52kg (115 lbss) is the main event of Botnia Punishment XI taking place March 23 in Seinäjoki Finland. MMA Viking talks with the undefeated Kankaanpää (5 wins and 0 losses) in an exclusive interview prior to the bout. MMA Viking : What do you have in your mind to fight V.V Mei? Did you check her video? Kankaanpää : I’m very excited about this match up. I´ve been waiting for an opponent like her, who gives good challenge. V.V. Mei is a good fighter and I believe that our match will be full of action. When I heard who I will be fighting against I watched a few of her fight videos to know what to expect, but I focus to my own training not to watching videos. MMA VIKING : You have started Karate since 16 years old. Please explain all your sport experiences after Karate. Where and when did you get hooked in submission wrestling? Kankaanpää : (I started to train karate when I was 15 years old) Already i was training karate I found wrestling, but it took a few years before I started to train mainly submission wrestling and mma. This year I’m hitting seven year mark on my training. Before submission wrestling and mma I tried other sports but I noticed soon that wrestling was my thing. I’ve trained at the MMA Seinäjoki gym my whole submission wrestling and mma career. MMA VIKING : In 2011 you had ADCC European qualification in Finland. And 3 Finland girls won in 6 winners of Lady’s -60kg and +60kg which was a great victory. In the Lady’s -60kg devision and the final you meet Sara Svenson. Can you tell us the fight? MMA VIKING : You have trained 6 years in MMA. What is your best fight? And the reason. Kankaanpää : It’s hard to say. I’m very self-critical and I always find something to improve in my own performances. If I have to pick best fight, it would be the one against Karla Benitez. I got the match in a short notice and I wasn’t prepared well. Still I went to fight confidently and I enjoyed been in the cage. I was able to take the fight to mat where I was stronger and the fight went pretty much the way I planned. MMA VIKING : What is your worst fight and why the reason? Kankaanpää : My first pro fight. I was nervous and didn’t get into the match very well. I controlled the match throughout but were not able to give my best in the ring. MMA VIKING : It is difficult for girls to find the opponent. 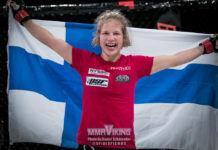 How many girls training MMA in Finland? Kankaanpää : There’s five women in Finland who has fought as a pro, but I’m not sure how many of them is active at the moment. There’s more women fighting as an amateur but I’m not sure how many. There’s more competitors in submission wrestling and BJJ in Finland. 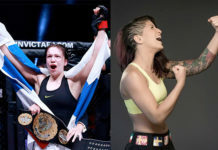 MMA VIKING : Can you mention 3 best MMA girls in Scandinavia (beside yourself)? Kankaanpää : First in mind comes Hanna Sillen. I don’t know so much about other women fighters outside Finland. There’s not so much free-time so it limits me following others. I’ve seen Sillens matches and I thinks that she is a good and versatile fighter. MMA VIKING : Who are your big 5 favotite male and female MMA fighters in the world? 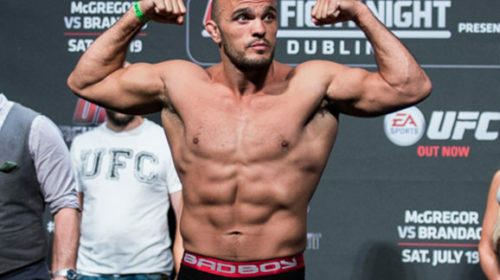 Kankaanpää : There’s a lot of male fighters whos careers i follow. If i have to choose five fighters they are GSP, Frankie Edgar, Phil Davis, Jose Aldo and Urijah Faber. In female mma scene I watch all the interesting fights but I don’t follow it like I follow mens mma. Womens absolute number one is Megumi Fuji. She is very technical fighter and most of her wins are by submissions. MMA VIKING : What is MMA for you? Why do you fight? What is your goal? Kankaanpää : MMA is a hobby for me although it takes all of my freetime at the moment. I work days but after that all my time goes to training. Sometimes I wonder why am I doing this especially then when I’m tired, sleepy and have to wake up at the morning to go jogging before work. Still I always come to same conclusion; it’s fun and I couldn’t live without training.